Wood Elf players are blessed and cursed when it comes to magic item selection for their characters. On the positive side there aren't that many good magic items in the new book so in many ways what worked in the last book still works. On the negative side there isn't a Banner of the World Dragon eskque item in our armoury. We got the dregs of the magic item barrel in terms of the quality and usefulness of our racial magic items. There are a few standouts but they are out numbered by average or just plain bad magic items. However i have already covered the racial items in part 2 of my review of the Wood Elf army book (it can be found here) so this post will be focusing on the core rule book items and how they can be used to benefit Wood Elf characters. When deciding what kit to give your heroes it is important to decide what role your hero will play first. Will he be a combat monster designed to slaughter your opponents troops, will she be a monster slayer with the goal of taking down the hardest of foes? This should be the first thing you do before you even select a character. Once you have done this then you should proceed to kitting him/her out. In this regard Wood Elves have some option that others do not. The Glade Captain and Lord both have access to all the enchanted arrows in addition to Asrai Spears as well as extra hand weapons, great weapons, shields and light armour. Before you even start dividing up the magic item allowance you should take a look at the arrows and mundane gear to see if there are any items there that can do what you want a magic item to do for less. For example if you are making a combat hero with the aim of killing enemy core troops it may not be a bad idea to give the character an extra hand weapon in place of the Sword of Battle, its 17 points cheaper whilst achieving the same effect. By the same token if you wanted one of your Wood Elf characters to have armour piercing it would be a far better idea to give them an Asrai Spear over the Biting Blade, there would be no upside to giving your character the blade over the spear. As I mentioned briefly above Wood Elf Characters can take The Enchanted Arrows. As pretty much everyone now accepts that the arrows can be duplicated this won’t prevent you from taking the arrows on other units. At the end of the day what arrows you give your characters will come down to your personal choice, but here are a few of my ideas on how you could use the arrows on your characters. Moonfire/Starfire – Whilst putting these arrows on a whole unit probably isn’t a good idea (unless you are tailoring a list to face a certain opponent) it wouldn’t hurt to place one of these arrows on a character. For a start they are only 4 points and for those 4 points you get a chance to take a wound off a charging monster who may cause your character and his unit grief. On top of that you have 30 inches of range so you can harass the monster dui jour for a full 30 inches, which could help sway the combat in your favour when the monster charges. And considering that you get +1 to wound (meaning that you will wound on no worse than a 5+ against either forces of Order or Disorder) there is a fair chance you will slowly chip away at your opponent’s prized gribbley monster. My personal choice would be Starfire over Moonfire as Disorder tends to have the scarier monsters but it should really come down to your choice and what armies are most common in your area. Arcane Bodkins – 5 points a model on a 11 point Glade Guard (making even a ten Elf unit cost 180 before command options are added) is a bad deal. However 5 points on a single model is a much better offer. The rationale behind this choice is much the same for the Star/Moonfire arrows, -3 Armour Save (shooting attacks only) on a single model who has 3 inch range and BS 6 at the worst (Glade Captains) and 7 at the best (Glade Lords) will knock off the occasional heavily armoured cavalry model, and as unit size ten is popular amongst 1+ armour save cav (as its toughness 3 provided the cav aren’t monstrous) knocking off the occasional model will hurt the units combat ability. Arcane Bodkins are probably the best choice of arrow on characters. Hagbane – 3 points for poisoned shooting is so cheap that there is really no point not doing it (unless you have already picked one of the other arrows). It could knock a crewman off a war machine or a wound off a multiple wound model, and if it doesn’t it cost only 3 points so it’s no big loss. I wouldn’t advise taking Trueflight or Swiftshiver, those are arrows that are far better when put on unis of at least 10 in size. Hitting on 3+/2+ or shooting 2 AP S3 shots a turn isn’t great for lone characters and I would advise against using these on characters, unless you have a cunning plan……. Now let use get onto the meat of character kit, the magic items. Firstly let’s look at what the army books offers here, the Spirit Sword, Dailths Reaper and the Bow of Loren. The Spirit Sword is nice but at 85 points doesn’t give you a lot to spend on defencive gear (which is absolutely priority one when kitting out Wood Elf characters, we don’t get decent non magic armour saves unless we are mounted and even then the best we can do is 4+ without magic items), only take it if you Are 100% certain that you have a way to buff your character up defencive wise (using Life magic would be one way). The Reaper is a good choice, allowing you to re-roll to hits, wounds and enemy successful armour saves. At 50 points you can still buy the Armour of Destiny (5+ AS and 4+ WS, it’s the best magic armour choice for Wood Elf characters) and it can help you kill common troops, characters and heavily armoured foes. Finally we have the Bow of Loren, an item best gifted to a Waystalker as it allows him to fire 2 armour ignoring sniper shots per turn and you can’t fire Enchanted arrows with it, oh and its 20 points so what’s not to like. If you do want to give it to a Glade Captain/Lord its not a bad choice, try to combo it with the Flaming Sword from the lore of fire to get the best use from it. In terms of the core rules magic items what you pick should reflect (as will a lot of your magic item selection) the role your character is trying to fill. There are some items that I recommend you avoid, the Sword of Battle (+1 attack, can easily be replaced by an extra had weapon), the Biting Blade (Armour Piercing, an Asrai Spear is a much better and cheaper choice), The Bezerker Sword (Frenzy, an extra hand weapon will give you +1 attack without Frenzy), Fencer’s Blades and Sword of Swift Slaying (Initiative 10 and Always Strike First, you don’t need initiative bonuses, you’re a Wood Elf player). Apart from the items listed above its really up to you how you kit your characters out with magic weapons so long as you keep in mind what you want him/her to do. The magic armour section should be your first stop for all characters who will even smell combat. We can’t get 1+ armour saves with mundane gear like the other elves so you should always be looking to augment your combat characters with items from this section. Remember that Ward Saves should always be put before Armour saves and that you should save the Talisman of Protection for your most important mage as they cant get any magic armour what so ever. The one stop shop for all your mages protective gear. All the Talismans of X are good options for your characters with the Talisman of Preservation being the best (and your first option when trying to protect your lord level mage). Other items like the Opal Amulet and the Dragonbane Gem are worth a look and could come in handy. In terms of what to avoid the Dawn and Luckstone are numbers 1 and 2, Wood Elves will never have good enough non magic item augmented armour saves to benefit from these items and I would advise against giving your characters the Armour of the Slivered Steed and the Dawnstone, it’s a waste of points and a Lord Level hero considering he would only have 40 points left and no Ward Save. The Enchanted items are where the best of the Wood Elf specific items live, mainly the Moonstone of the Hidden Ways and the HODA! (Hail of Doom Arrow! The exclamation mark is key). Oh and there is they Acorn of the Ages, a item that Wood Elf armies need but resent for its ability to generate more forest but at 100 points. The HODA should be your first pick when visiting the Enchanted Items section, a one use only 3d6 strength 4 multiple shot shooting attack with Armour Piercing (and at 30 points!!) shouldn't be skipped, although selecting a target for the HODA is the hardest part with choosing when to use it being the second hardest. The Healing Potion is great for fragile characters who don't have a Life Mage or Sisters of the Thorn nearby. The Crown of Command is a decent item but you should really spend the rest of your points on defencive gear to keep your character going. 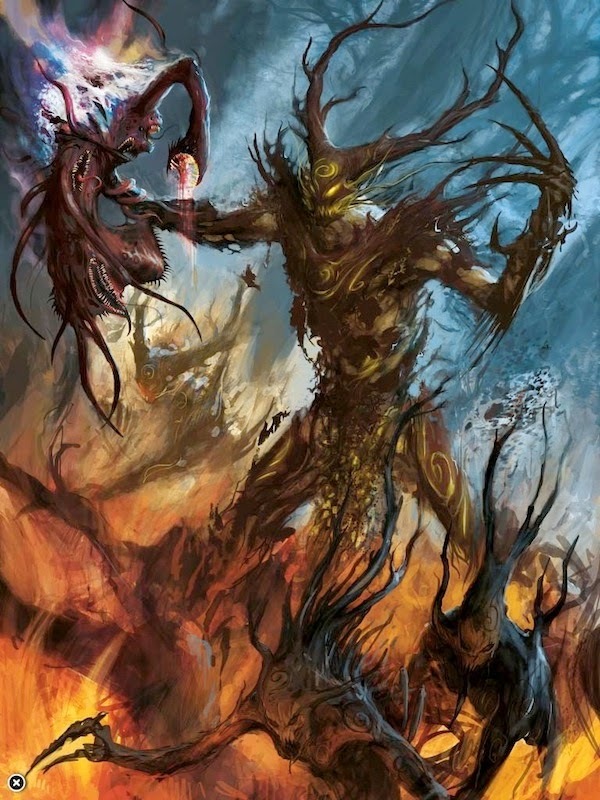 The Potion of Strength and Toughness are both quite handy for the Strength and Toughness deficient Wood Elves and the Other Trickster's Shard is great for a laugh, especially against other Wood Elves and Demons. So thats the Character kit tactica, keep in mind what i said at the beginning that you must determine the role of the character first and keep that role in mind when gearing up your character. Before i go i just wanted to put in a final word about the CTA 2014 lists that were released last night (you can find them here). First impressions are good, there are a reassuringly few high armour save centric armies (and high toughness armies) and over all things are looking good, i aim to try and get near the middle of the table (13th place or there abouts) and just by looking at the lists i think its quite doable. Until next time.